The crystals which form in the solidification of a metal may have many different structures (denrite, lamellar, needle-type or acicular etc.) depending on the rate of cooling, and the type and amount of admixtures or impurities in the melt. Perfect crystals of proper external shape can be obtained only if crystallisation develops under conditions when the degree of super cooling is very slight and the metal has a very high purity. In great majority of cases, branched tree like crystals are obtained, which are called dendrities. A freely growing crystal acquires a dendritic (tree like) shape (shown in Fig.). It has been established that crystals grow with the highest rate along the planes and directions where atoms are packed most closely. Thus, long branches grow first, which are called the first-order dendritic axes. Then second-order axes branch off from them and third-order axes from the second-order ones, and so on. Finally, the metal remains between dendritic axes solidifies. 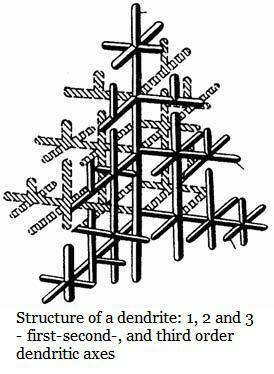 Dendrites grow until they interfere with one another. After that the interaxial spaces are filled in and the dendrites turn into continues crystals of an irregular external shape. Such crystals are called grain or crystallites. If there is enough liquid metal to fill in interaxial spaces (for instance, at the opened end of a mould where a shrinkage cavity forms), some crystals may retain the dendritic shape. On solidification, impurities concentrate between dendritic axes at grain boundaries; further these are the most probable places for the formation of voids, because of shrinkage and impaired access of liquid metal to the solidification front.